Members of Amalgamated Transit Union Local 788 picket outside Metro Transit headquarters in downtown St. Louis on Thursday, August 28, 2014. 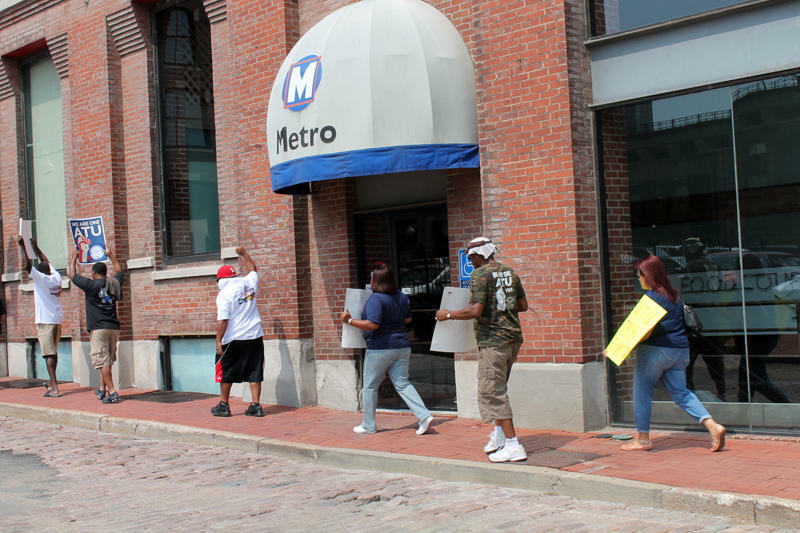 The union that represents local bus and train drivers and mechanics picketed outside Metro headquarters in downtown St. Louis Thursday. Many of the workers were upset that Metro CEO John Nations’ annual salary will increase by $75,000 beginning in 2015. Union members say they haven’t received a raise in six years. According to Nations, Metro’s board approved his raise as part of renewing his contract and represents a three percent increase from his current salary. He said that Metro’s proposed contract for ATU union members would also raise their income three to four percent. 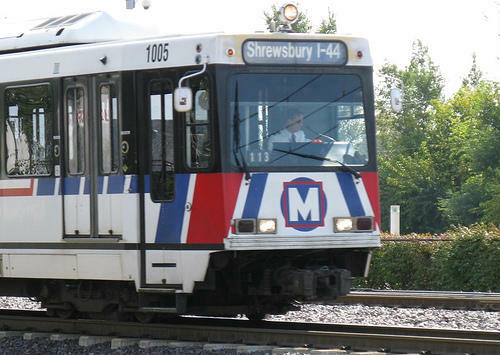 The president of the union’s St. Louis chapter, Michael Breihan, says contract negotiations between Metro and the union have reached a stalemate over retirement plans. Local 788 wants to keep its existing pension plan, but Metro wants to give new employees a 401(k) instead. 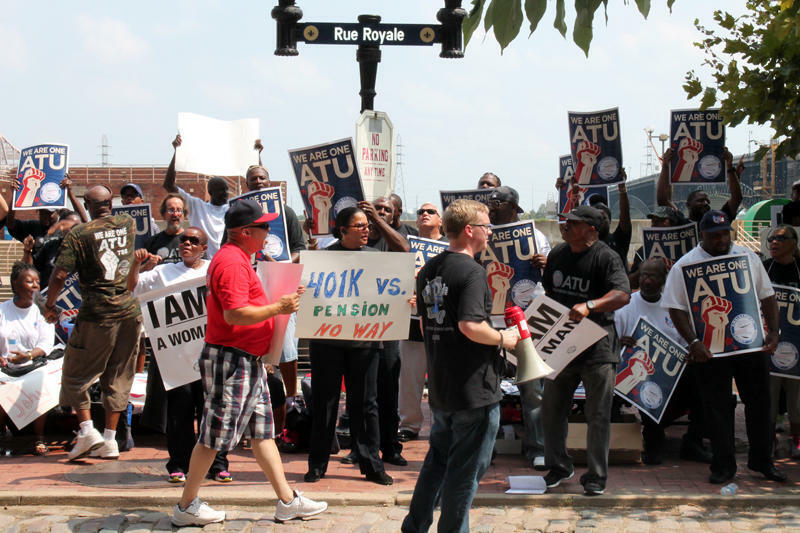 Transit union demonstrators march around Metro headquarters on Thursday, August 28, 2014. “If we were to go to a 401(k) it will kill the defined benefit plan. We’ve got 900 and something retirees out there right now. There’s no way I want to make that phone call and say guess what, you’re not getting a pension check this week,” said Breihan. Nations said that fear is unfounded because retirees would continue to receive their pension as always under the proposed contract. He said the switch to a 401(k) would only apply to new employees, and that the reason for the proposed change is to keep the retirement fund solvent in the years to come. “With all the difficulties pensions have in St. Louis, for our company, around the country, we think we need to start something different for new hires. And they absolutely refuse. As a matter of fact, they absolutely refuse to even talk about it,” said Nations. Breihan said that the union has no plans to strike because it is against Missouri’s statutes, and the workers’ old contract has a no strike clause. But he didn’t rule out “blue flu” – a day where members call in sick in numbers significant enough to slow Metro’s operations. Starting this summer, it will cost more money to ride some of Metro’s public transportation services. 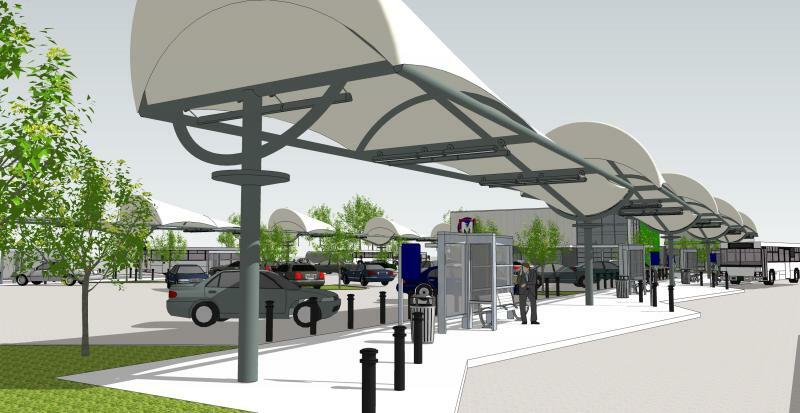 Metro’s Board of Commissioners on Friday approved transit fare increases that will go into effect on July 1. It comes after the agency solicited public feedback on how to raise fares for bus and train services.